Pete Buttigieg Is a Political Star. You Just Don't Know It Yet. Buttigieg (orig. Maltese) is pronounced “Boot-edge-edge,” as Democratic presidential longshot Mayor Pete Buttigieg himself wrote on a Medium blog two years ago. His husband Chasten added on Twitter, “Buddha-judge,” “Boot-a-judge,” or “Boo-tuh-judge.” Before long, it may be important to know how to say his name. Buttigieg, 37—son of a Maltese immigrant and multi-generational Hoosier—is a Harvard grad, Rhodes scholar, and Afghanistan War vet from Indiana who is married to a man. In 2011, at age 29 he took 74% of the vote in the mayoral election of South Bend, IN—pop. 102,245—making him the youngest-ever mayor of a town of more than 100,000 people. He’s held the job ever since, with the exception of a 2014 hiatus to serve a tour in Afghanistan as a lieutenant intelligence officer in the Navy reserve. Buttigieg speaks speaks Spanish, Italian, Maltese, Arabic, Dari, and French, and after reading the novel “Naïve. Super” by Erlend Loe taught himself Norwegian so he could translate more of the author’s work—then attended a Norwegian church in nearby Chicago to stay in practice. The clean-shaven, outspoken liberal is also a guitarist and concert pianist who has sat in with the South Bend Symphony as well as Ben Folds. He and his husband, Chasten, have two rescue dogs, including a one-eyed mutt named Truman with his own Instagram account. A member, as is this author, of the Oregon Trail generation, Buttigieg will, if elected in 2020, become the youngest and first openly gay president in U.S. history. To be sure, given Buttigieg’s youth (and, sadly, perhaps also his sexual orientation) he is—at least from this vantage—perhaps the longest of long shots. But he has a lot going for him, not least of which is his demonstrated appeal to conservatives in his home rust-belt state. He trades heavily on this, and smartly so: It sets him apart from many pack leaders, and when you combine that appeal with his unique identity as an openly gay man it might even convince you that what we now see as impossible—a semblance of cross-party unity in the middle of a pool poisoned by the right-wing’s bad-faith identitarian politics—isn’t a lost cause. Thanks in part to a breakout performance at a CNN Town Hall, during which longtime Obama strategist David Axelrod tweeted Buttigieg was “crisp, thoughtful and relatable” and would be “a little less of a longshot tomorrow,” the candidate took in more than $600,000 from more than 22,200 donors within 24 hours of that event. His letter of support to the South Bend Muslim community in the wake of the Christchurch white nationalist terrorist attack—which went viral—Buttigieg has seen his profile and polls rise over the last week, ticking up to 3% in the most recent Emerson Poll. Major media outlets have published profiles of and interviews with him, most recently including the Washington Post and Esquire. In certain ways—youth, style, and tone—he calls to mind on-screen media darlings like Barack Obama and Beto O’Rourke. Buttigieg speaks in paragraphs, an authoritative, professorial style that—I know full-well this sounds fawning, but I mean it earnestly—often borders on the poetic, even and especially when discussing policy details. And like Obama—but unlike O’Rourke—Buttigieg has an uncommon talent for maintaining an off-the-cuff, from-the-heart tone when he’s actually repeating the same sophisticated and well-tested talking points almost verbatim. 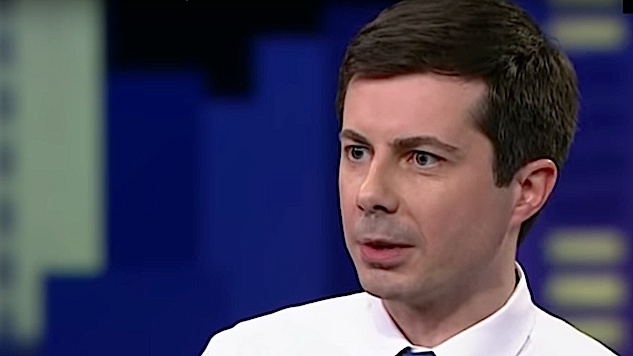 Further, “Mayor Pete”—as his South Bend constituents call him to save time and frustration—disciplines his demonstrable passion with a commitment to inclusive rhetoric, from which he never really departs (with reasonable exceptions for extremes such as Donald Trump and white nationalism). In today’s political culture, that’s a remarkable feat, and—as reflected in BuzzFeed News’ on-the-ground reporting from O’Rourke appearances in Iowa—it offers voters a reprisal from the daily toxicity that for many Americans who aren’t absorbed with politics (or don’t simply have the time for it) supersedes the policy wonkery that the self-appointed left-wing literati place above all. Buttigieg has two Achilles heels: youth and extraordinarily limited political experience. But for Beto skeptics nonetheless moved by the oratory and aspirations towards a semblance of unity, Mayor Pete also checks the policy and substance boxes. He’s worth a good-faith hearing out. In fact, the bona fide intellectual—Buttigieg wrote his Harvard thesis on the influence of puritanism in U.S. foreign policy as portrayed in Graham Greene’s “The Quiet American,” and as a Rhodes scholar earned a first-class honors degree in politics, economics, and philosophy from Oxford University—can hang with any candidate in the field. Buttigieg won’t pass the progressive purity test—he’s accurately said the term has “lost its meaning”—but he makes his liberal politics clear. Adding seats to the Supreme Court. Yes. But only “if it’s part of a structure that depoliticizes the Supreme Court.” Buttigieg’s plan to reform the “nakedly political” nature of our highest court resembles the Federal Reserve Board structure: A Court of 15 Justices, five selected by Democrats, five by Republicans, and the other five chosen by the Justices themselves. The electoral college. “It’s gotta go. We need a national popular vote. It would be reassuring from the perspective of believing that we’re a democracy. But I also think it would be highly encouraging of voter participation on the national level. “Economic anxiety” and the rise of white nationalism. This is perhaps where Buttigieg is at his most eloquent, turning a venomously and now murderously divisive issue into an opportunity for growth. The Post’s Greg Sargent tweeted of his interview with Buttigieg that “he talks about race and the economy in a way that gets beyond the tedious ‘LOL but economic anxiety’ versus ‘not everyone in Trump country is racist’ debate.” In his recent Morning Joe interview, Buttigieg connected white nationalism to the rise of AI and automation to national service, the military, marriage, and career-hopping in 90 seconds. Immigration. Buttigieg is staunchly pro-immigrant. He wants to roll back Trump’s policies and raise immigration caps across the board, but he also manages somehow to embrace possibilities for reconciling that position with the right wing’s obsessive and baseless xenophobia: “You might have followed this widely publicized case involving a small-business owner from Granger, the next community over, very conservative. This guy was an important part of the community, undocumented, went in for an annual ICE visit and didn’t come back out. “The fiercely protective response came mostly from white members of the community who were conservative and largely voted for Trump, but did not view what he was talking about as going against somebody like Roberto, who they loved. LGBT issues. He married a dude. But obviously that’s not an explanation in itself. Members of the LGBT community have expressed a desire for Buttigieg to be more comfortable advocating for their issues—which are clearly near his heart—but the same people also understand the political complexity he faces as a gay man, and because he hasn’t exactly been silent on the issue—here’s an interview in Out Magazine in which he explains why he believes America is ready for a gay president—many in that community trust he’ll deliver. Truth is, Buttitgieg sexual orientation probably won’t matter much to most Americans. Still, it seems he’s feeling it out: Continue on the subversive high-road for a while and in the near term risk upsetting LGBT Americans who want him to more publicly own his identity and use his platform to advocate for them; or speak up forcefully now, call attention to his identity, and risk kick-starting what will unfortunately but inevitably be ugly, ugly backlash from the right. If he hangs in the race, he won’t be able to ignore it forever—the only question is when he turns that corner.